The south-west region of the Peloponnese is home to the beautiful county of Messinia. It is an area of immense natural beauty, and one with inspiring scenery and landscapes, where you can enjoy very unique and rewarding holidays and vacations. The capital town of Messinia is that of Kalamata, one of the most charming towns in all of the Peloponnese.Dominated by the 13th century castle that stands pround above the town, Kalamata is a wonderful place to visit and explore. Views from the castle stretch out over the green fields to the blue waters of the sea. Kalamata has some very interesting sights and museums that are well worth visiting if you find yourself close by. It is also an ideal base from which one can head out and explore some of the other wonderful towns and villages spread out around Messinia. There are several lovely coastal resorts such as Kiparissia and Methoni, which offer a perfect setting for holidays and vacations right next to the sea. As well as the beautiful beaches, Methoni also has some very interesting churches and mosques that are worth visiting. 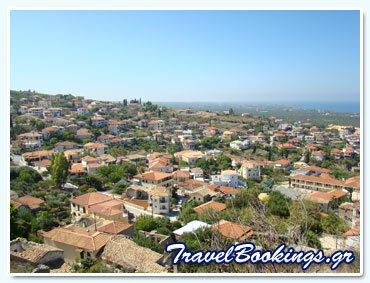 The town of Pylos is a historical and traditional settlement, and is an ideal place to visit for an enjoyable day trip. Pylos has a very interesting history, and the various sites and ruins you will find around the town shown that it was once of great importance. Messinia is an extremely beautiful region of the Peloponnese, and offers visitors all types of holidays, from relaxing and tranquil ones, to those filled with great fun and various activities. Below you will find information about the current accommodation and hotels that we have available in the Messinia region of the Peloponnese in Greece. For more information about the accommodation or hotel, or to check availability and rates, simply click on the corresponding button.